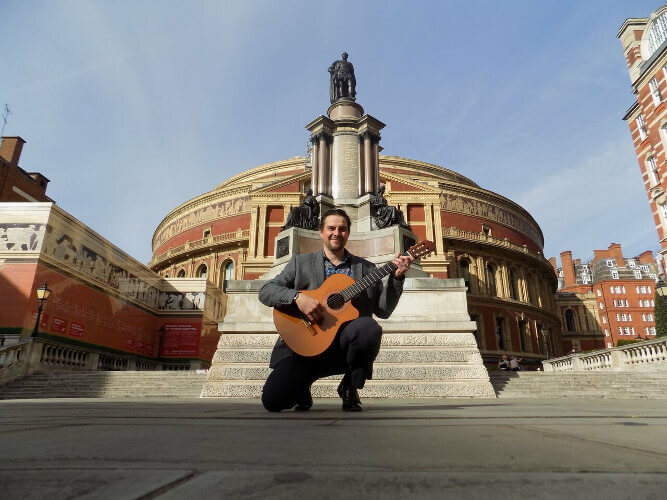 Romeo Scott is a brilliant young Spanish & Classical Guitarist available for weddings, parties and corporate events. He is a seasoned performer with hundreds of professional playing hours to his name with previous clients including the BBC & Rock FM. Romeo has also appeared on BBC One as part of the entertainment team on Restoration Roadshows, performed at the Royal Albert Hall and played at many International & Arts Festivals throughout the UK. Romeo has very extensive repertoire Scott has a wide repertoire ranging from classics such as Cavatina, The Deer Hunter, Memories of the Alhambra, Romanza and Bach’s Prelude, through to arrangements of popular music such as Fields of Gold, Here There and Everywhere, Love Story and Kiss from a Rose. 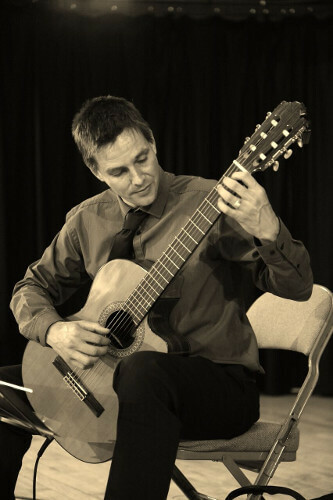 Professional Spanish & Classical Guitarist available for weddings, parties and corporate events. Wide repertoire of classic, Latin/Spanish music as well as arrangements of popular music. "Fantastic artist - Romeo was very accommodating and professional and everyone loved him. Thank You." "Amazing! I would totally recommend this man! Beautiful music, all our guests loved him x"
lly well. I would certainly recommend Romeo." "Romeo was fantastic - just right for this event and a really lovely guy too. I would totally recommend him for future events of this nature." "Romeo was absolutely fantastic and I would highly recommend him at any event. He played during the champagne reception and as we sat down to dinner and it just worked so well. I have had several comments in thank you cards of just how good he is. He is such a lovely gentleman too, I cannot commend him enough." "A very smart, personable young man who turned up on time and everybody commented on what an excellent player he was. I would not hesitate to recommend him, he really added atmosphere to our party." have no hesitation at all either hiring him for another BBC event or recommending him for any event." "I adore your music. It is so calming, relaxing and beautifully played." "I will certainly keep you in mind for future events, we received many favourable comments from guests who really appreciated your performance." "Just wanted to let you know how much we appreciate your contribution to our prize. You were fantastic on the day and complemented our service so brilliantly. Cannot thank you enough!" "Everyone complemented the guitarist who made the atmosphere really special." 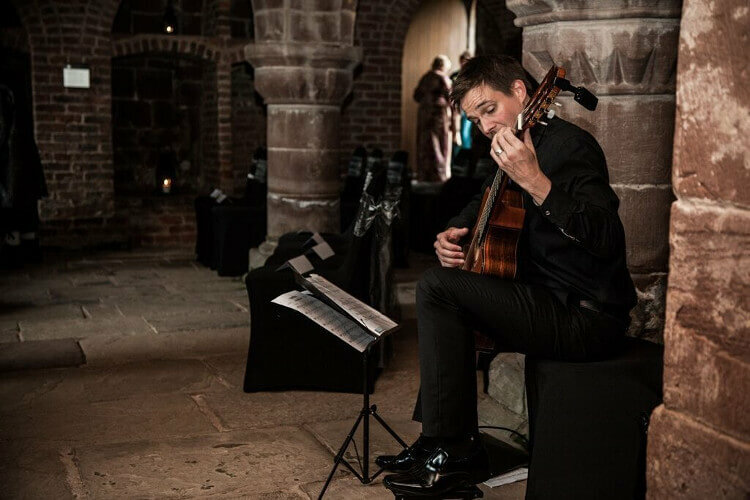 "The music he helped us choose for our wedding was so appropriate and extremely well presented on the day. He offered an impeccable, reliable service." wonderful in his playing and was open to questions in between performances. He was very professional and built up a good rapport with his audience during the afternoon. We've asked him to play again for us next year, for a music therapy event." "The ladies of Pulham St Mary are still talking about the classical guitarist in the tuxedo! His lovely music really contributed to making our Restoration Roadshow a very special event." "Again, thanks for putting on an excellent performance, it sounded beautiful."